Sidhil News: Clive's on the run! It finishes in the historic centre of Venice, in the picturesque waterfront of St. Mark’s Basin. 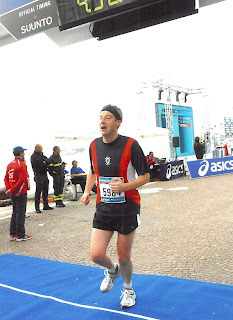 The final stages of the race are unique – runners follow the Giudecca Canal to Punta della Dogana, where they cross the Grand Canal on a pontoon bridge built especially for the race, passing through Piazza San Marco and crossing 14 little bridges over Venice’s canals. Sidhil’s Sales & Marketing Director Clive Siddall was there this year and ran the race, completing in a very creditable 4 hours and 32 minutes. “It was a fabulous experience – the international marathons really are party time for those of us lucky enough to participate,” he said. Clive’s next marathon is Amsterdam 2012, where 22,000 runners from 80 nations expected to participate - the event is one of Europe’s biggest annual road races.